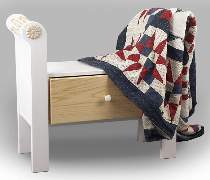 A sturdy bench for the end of the bed, or place it in the entry way for a place to sit when changing shoes or boots. Large drawer provides lots of storage. Patterns drawn FULL SIZE. Measures 26"H x 29-1/2"W x 12"D. Order two #5985 Embossed Wood Ornaments, ten #S110 Spindles and one #1518 Knob separately or see Special below.